In my youth, I had the lucky chance to be raised on a farm in Iowa. Growing up I thought a lot differently and hated going out to do chores, shoveling pig manure, or walking beans. At the time it felt pointless, and I felt like free labor to my dad, Grandpa, and uncle. Without my parents knowing it, farming taught me a lot about finances and how to manage money. 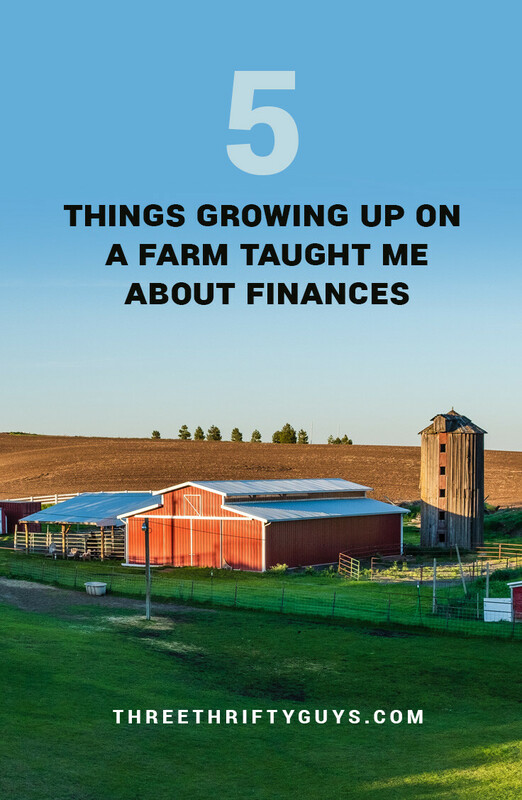 In looking at my youth I came up with these small, but significant ways that living on a farm taught me about finances. Farmers are the biggest optimists and the worst pessimists. When the markets are hot, then farmers think they probably shouldn’t sell now, because it’s going to go higher. Then when the market is down in the dumps, most farmers have tons of regrets. An important lesson I learned was to slowly (dollar cost average) sell when the market offers you a good price. This could be anything from toilet paper to corn to gold coins. You never know when the peak or valley will come, so sell when you’ve got a good profit. In 6th grade I had the responsibility of bringing the wagons in from the field, and one year I was bringing in a 250 bushel wagon of beans up to the farm house. We were going to put the grain in the bin and store it for winter. So I decided to drive the tractor and wagon in 4th gear (highest gear) up to the farm in order to get done faster. I was so stupid and kept driving in 4th gear as I turned the corner to go up to the farm. I ended up rolling the wagon and spilling all 250 bushels of beans. My stupidity cost my dad about a $1000 to replace the wagon tongue, but luckily no one was hurt. It helped me learn to not be foolish with my possessions and not be in such a hurry! Grandpa always sat with me in the living room rocking chairs until midnight chatting with me about farming, the Depression, and just about life in general. I’d gladly sit with him there for hours and just listen and ask questions. I knew if we forgot our past, then we’d soon repeat it. His words of wisdom about how to learn from the past helped me taught me so much about finances and how to protect my family financially. Farmer’s income is so dependent on the weather and when the rains come. It leaves so much up to chance. In watching my Dad and Grandpa, I always saw the worry when rain wasn’t coming, and the crops were starting to wilt or when we’d have a big flood. They always tried to do their best to save some of their income in case “this year” was a bad year. Ya never knew what each year would bring in terms of weather. All they could do was sow the seed, hedge their grain, buy crop insurance and pray for timely rains. No matter what time of year it was there was always hog manure to be shoveled and hauled out to the field. Seemed like such a trivial and boring job that got to be old. I’d frequently complain and whine about having to do this “crappy” job, but it needed to get done. I don’t know how my dad put up with my whining! Regardless of how horrible the conditions were I truly learned the value of “an honest day of pay for an honest day of work.” I hated the job at the time, but when I look back it helped me learn how to work hard. I’m glad my parents pushed me into doing this! Working in the corporate world now, I know how to work hard and be of good value to my employer. There are probably a lot more ways that farm life has taught me about finances, but I can easily see how these five have translated into life now. I know that not everyone was raised on a farm, but I’d be interested in hearing how your upbringing formed your view of finances. It can be both positive or negative. Why Do You Do That With Your Finances? Charlie, your post and childhood reminded me of one of my fav books, A Painted House by John Grisham. I also grew up on a farm, much smaller than yours, but it definitely taught me the value of hard work and being unselfish and working toward the good of the family. Great post! Thanks Kyle! Living in the city now I realize how I took growing on the farm for granted. Honestly, my growing up on the farm was on John Grisham painting. It was more so like an episode of hoarders and house on the prairie in one. :) haha Either way it was what God had in store for me to make me the man I am today. For that I’m eternally thankful! Shoveling s#!t and paying your dues is the key to success. Most people look at successful people and think luck got them there, they didn’t see all the hard frivolous work that was put in. I love this post! Our parents have a big impact on the lessons we learn, financial and otherwise. My mother grew up dirt poor in the Philippines, and she taught me to ask myself three times before I spent, even a dollar, “Do I really need to buy this?”. It seems like overkill since a dollar purchases so little. But my takeaway now is that my mother’s line of reasoning is a great defense against consumerism. With all the voices asking you to purchase this or that, where is the voice railing against the rampant purchasing? My advice here is to just turn off the tv so you aren’t tempted to see what new products you “need”. I would add that being lazy costs you money. Farmers that don’t clean pens every day and don’t fix problems as they arise end up with larger vet bills or dead stock or lower crop yield. Being lazy with your finances costs money too. Not bothering to look for lower interest rates or not taking the steps to move from mutual funds with high maintenance costs to lower expensed ETFs or even the simple things like using a cash machine connected with your own bank and not paying an extra fee can cost you a lot of money in the long run. A lazy farmer is not a good farmer. Some what tongue in cheek and some what serious, learning to grow your own food may not be such a bad idea either. With the price of food rising with no end in site and the farm to table movement seemingly getting stronger, America may soon learn to decentralize their grocery needs. Chad – that is another good example of things to learn on the farm. Like I said there are a lot more things I learned on the farm. Charlie, I never tire of hearing your stories about farm life. All awesome tips here. Growing up we were dirt poor in our family. My first “lesson” from that was to buy all of the stuff you want now because you never know when you won’t be able to buy again (or charge it, as the case was). The second, and obviously real lesson from growing up so poor was that it is crucial to manage your money wisely and to utilize value-based spending. Before we were trying hard not to look poor, now we’re trying hard not to be poor. Big difference. Laurie- I struggled growing up too not wanting to look poor. I had one incident where my mom had bought a coat at a garage sale. I wore the coat to school the next week and one of my classmates said that was his coat and asked where I got it. I said my mom bought it, but wasn’t sure. He said it was his, and his parents sold it at a garage sale. I was so embarrassed and never wore it again.